Not many restaurants in Kathmandu build their menu around healthful, organic dishes. Shabri The Restaurant is thus almost an outlier in this regard. 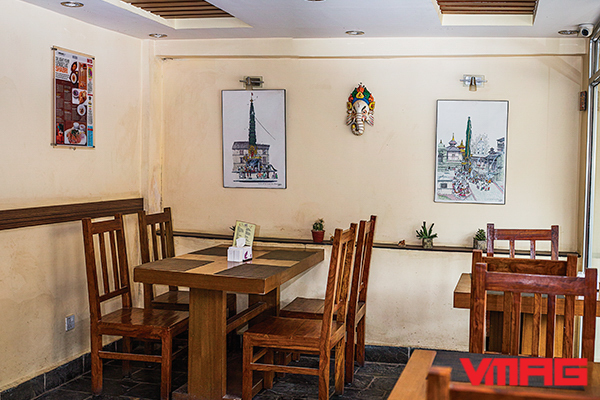 Located in Sanepa, in a quiet setting, this laidback restaurant is the place to go to for diners who’ve become jaded with the run-of-the-mill dishes offered by most Kathmandu outlets. The restaurant derives its name from a character in the Ramayana. In the epic, Shabri scours the forest for the sweetest fruits to offer to Ram. You could say that the restaurant is informed by a back-to-nature ethos—both in its dishes and decor. Shabri offers a multi-cuisine menu that features a mix of Indian, Continental, Nepali and Swiss dishes. It is probably the only restaurant in town that offers Swiss cuisine; they import most of the ingredients for their Swiss dishes from Switzerland itself. They also have a separate bakery menu, and all bakery items are baked in-house. You also get seasonal fresh juices and smoothies. The establishment sources most of their produce from local organic farms, and they also grow some of their own vegetables and herbs. 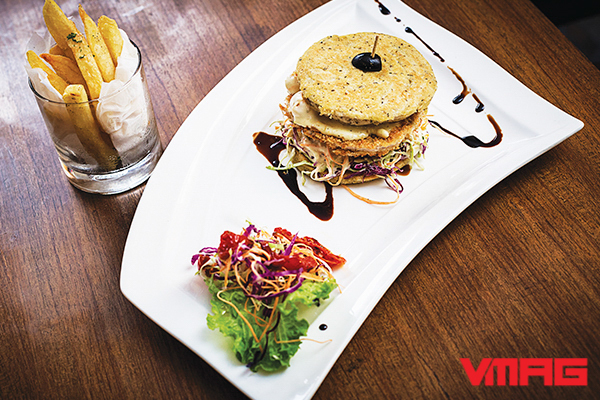 We had the chef’s three signature dishes: Multi-grain Pancake, Bara Burger and Shiitake Green Momo. The Multi-grain Pancake is made from a mixture of buckwheat, millet and wheat flour, and the pancakes were served with wild organic honey and strawberry syrup (prepared in-house). The soft and fluffy pancakes were crispy on the edges and moist on the inside. The next dish we had was the Bara Burger. I’d never heard of, let alone tasted, a bara burger before, and I didn’t know what to expect. In this dish, the conventional burger buns were replaced with baras, made from black lentil batter. The patty was a sizeable chunk of minced chicken, and topping it was a generous amount of lettuce, onions, diced oranges and cabbage slathered in mayonnaise. The patty’s minced chicken, tender and cooked just right, was crunchy on the outside. The oranges added tanginess to the dish, and it surprisingly went well with all the other ingredients. The baras had a rough, grainy texture, and since they were cooked in mustard oil, the dish exuded a flavour that is distinct to Newari fare. The burger came with a salad of lettuce, thin strips of onions, carrots and cabbage, and sundried tomatoes. The last dish we tried was the open-faced Shiitake Green Momo. The momo was unlike any I had ever had before; the momo wrapping was made with a blend of spinach and flour, which imparted the wrapping a green colour; the fillings were made up of minced shiitake mushroom, cabbage, onions, ginger and garlic. The shiitake mushroom provided a rich, buttery, meaty flavour; the garlic and ginger added warm, spicy notes to the dish; and the vegetables provided the crunch. The dish came with two varieties of pickles: one had a hint of sour in it, and the other was spicy. 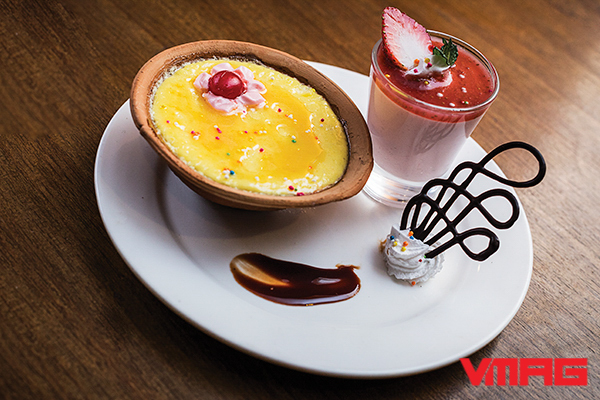 For desserts, we tried the strawberry mousse and passion-fruit cream brulee. The mousse was velvety and creamy, while the fresh strawberries added a hint of tanginess to the dessert. The brulee was creamy and sweet and sour at the same time. The restaurant’s decor is minimalistic. The walls are bare, except for a few paintings. Plain wooden tables and chairs make up the seating arrangement, thin wooden-slat roll-down curtains lend an earthy tone to the overall setup, and when the curtains are rolled up, sunlight streaming in from big open windows fill the restaurant with natural light. 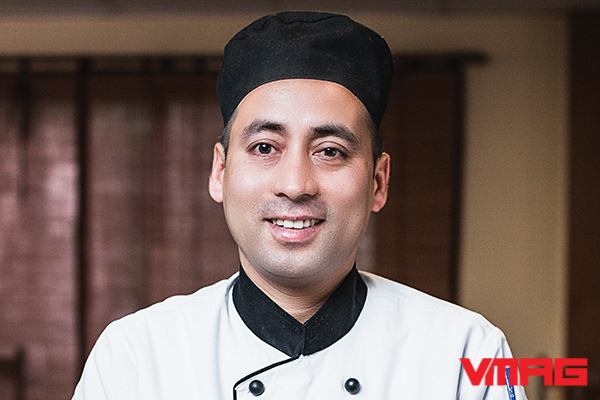 Chef Tek Bahadur Nepal has been working in the food industry for more than 15 years, and has been the executive chef at Shabri The Restaurant for three months now. His previous stints included working at the Hyatt Regency Nepal (where he was named the ‘Employee of the year-2007’) and Hotel Annapurna; he has also worked abroad—in Lhasa and on a cruise-ship in Italy. 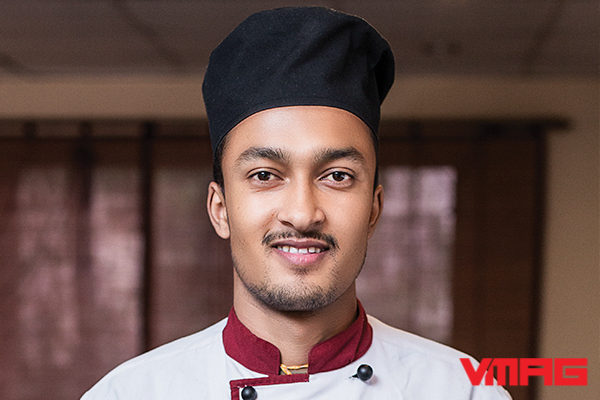 Nepal specialises in Italian and Continental delicacies, and loves experimenting with his dishes. He loves working with fresh organic food and creating a fusion of dishes from different cuisine types. And he is compulsive when it comes to maintaining the kitchen’s hygiene. Bishnu Lakai, the baker at Shabri, has four years of baking experience. He was initially trained at GATE College, and his baked goods are delivered to various outlets, like QFX Labim Mall, Level 3 and KCM College, among others.